Walsine Pierce: GOOD OLD SUMMERTIME? Could Fool Me! SUMMERTIME? Life can sometimes be quite confusing, huh? What's the date? Well, as you can plainly see I've today crossed off April the 13th. Thank goodness it's a Tuesday and not a Friday, not that I'm superstitious or anything. The weatherman forecast a high of 64 degrees and bright sunshine and he hit it right on the nail head. Still, I'm confused! Is it the birds and the bees? No, as you can plainly see the tulips agree with the robins and say it is still spring. Could it be the beautiful smells in the house? Well, that is a bit confusing. Comingled with the smells coming from the Easter lillies are the smells from a vase of cut Roses. But, that's not the problem either. The problem? I've just enjoyed a past time which I associate with the late summer months. I just snapped and stringed some green beans for the pot. Is there anything more relaxing than just sitting there snapping green beans? I don't think so. And, it brings back so many memories of family and times so fondly recalled. Julie, Donna and I made a trip to the Hartville Farm Market yesterday. It was chilly out and I went inside to keep the coffee warm! Un huh! Before I did I told Julie to get some green beans and new potatoes. She did but she let the trader pull a "hookie doo" on her. The beans I saw were lovely. The beans she brought home were blemished and had been frozen. There is always waste in green beans but I barely got a "mess" out of two pounds of beans. Julie said the man did not get the beans from those displayed but from another group. Yep, the old "switcheroo". With new, red potatoes and corn cut off the cob is how green beans should be cooked. Julie doesn't like the corn so I don't add it. BOO! The new, red potatoes were also a joy to cut up. And, of course, lots of ham. We have ham up the ying yang from the crowd we had at Easter. Lots of ham to season the beans. Yum Yum! Beans need to be "cooked down" to taste right. My son-in-law, Jack, just barely "steams" his green beans and, to my way of thinking, eats them while they are still raw. He says "crunchy". They are crunchy alright! They are still a pretty, bright green but cooked green beans are not supposed to be "green", are they? If I could bottle the smell that premediates the entire house from that pot of beans, I could sell it for a fortune. Even with the powerful odor of the Easter lilly and the cut roses, the entire house has the summer smell of green beans, red potatoes and ham a'cookin. Is it the good old summer time? No, but it won't be long. At breakfast today I told Julie for she and Donna, in the coming months, to empty all of the jars of canned fruits and vegetables. I want to refill them fresh in preparation for what I fear will be an Obama Winter. The Boy Scouts are right! Be Prepared! 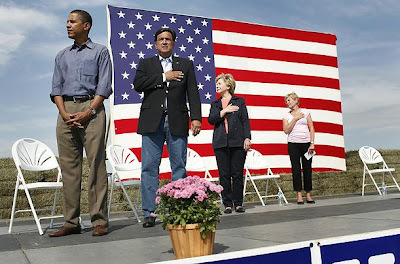 And, remember this picture of President Obama dishonoring the Pledge of Alliegence to the United States of America! Plan to vote! So, is my life NEW, DIFFERENT AND EXCITING today? Yep! A new blog, cooked a pot of green beans and played with my two lovely grandchildren, Riley and Rosebud. Life doesn't get any better than that!